Cabinet design is unconventional and allowed the designer esthetic freedom whilst in fact increasing structural strength and reducing unwanted resonances from the enclosure. 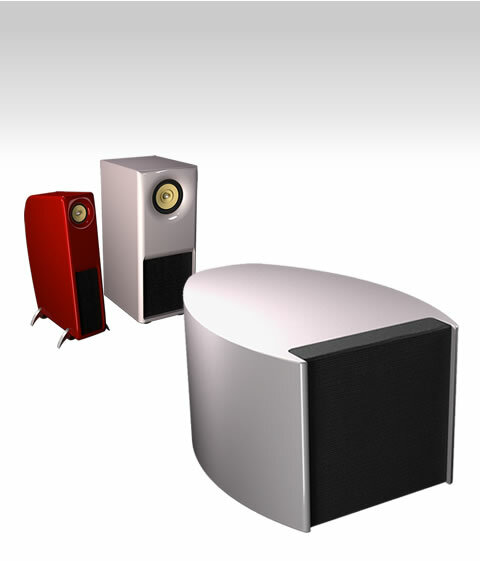 Earo believes that it is an advantage to have the lowest frequencies generated by a single base unit for the low end rather than having this produced by the main speakers. The reason for this is that dispersion of the base is more uniform in the room and not subject to the phase nulls and highs that two drivers produces. Also, with an active DSP automatically correcting room nodes in both frequency and time domain, performance is optimized. Digital signal processing also deals with the mixing and separation of audio to the sub and remaining sid speakers. Finish may be ordered in standard configuration of Piano black, Chinese red, Ferrari Red, Yves Klein Blue and Pearl Blizzard White. All in high gloss hand rubbed lacquer. Alternatively custom order of veneering is available with a choice of light or dark veneers. E-Low will play down to 15 Hz and provide full sound pressure level at this frequency. What is unusual is that E-low achieves this is using non-resonant technology. To reach these goals digital phase linear filters and high powered D-class amplification processes are employed. All digital filter processing in the DSP uses 56bit resolution. E-Low may be used with any Earo speaker to reach the rocking bottom of all recordings. We have included our linear phase active crossover allowing you to connect E-low to any hifi system or home theater, greatly extending the experience. E-Low is a bass driver and these normally operate from 100Hz and below. At these frequencies the directivity is not apparent by the human ear why large freedom of placement exists. However, placement shall be made in order to avoid exciting the room nodes and forco-timing with the main system. Corner placement, although it will increase bass response, is not recommended. An elegantly designed industry standard VESA fixture is available allowing the E-Low to function as a stand for an LCD or Plasma flat screen television. Cables are hidden from view by being routed inside the fixture. Audio; Left/Right balanced XLR line for direct connection from preamp. One balanced LFE signal input mixed with main stereo for use with cinematic effects. Indicators: LED for standby and ON, Eq status. N.B - Information is preliminary and subject to changes.